Volkswagen has been an advertising trail blazer since the Mad Men days, when Bill Bernbach (the ‘B’ in DDB) created a legendary campaign that even caught the attention of Don Draper. Spanning the decades, ad agencies and automobile models for a comprehensive review of VW would be a lengthy process, requiring a Sterling Cooper-esque amount of liquor to complete. In the interest of my liver and to write a needlessly esoteric piece, I present six of the German auto maker’s campaigns and their not-so-obvious connections to the sitcom, Seinfeld. (Inspired by this great 11 Points article). An iconic, early-60s print ad from Bernbach. In a season two episode entitled “The Phone Message,” George and Jerry need a signal for George to call out as Jerry attempts to switch the tape in George’s girlfriend’s answering machine. If you need any more context, you’ve probably already stopped reading. They decide on “Lemon Tree,” a song written in, of course, the 1960s. Uncanny. Another from the famous DDB campaign. The diminutive size of the Bug was one of VW’s major selling points, letting us know that bigger is not always what it’s cracked up to be. George Costanza, on the other hand, would probably argue otherwise. In the season five episode “The Hamptons,” George’s time in a pool resulted in the term “shrinkage” infiltrating popular lexicon. If there is a painfully obvious lesson to be learned here, it would be this: Size – whether it be of a car or a certain “schizophrenic” organ – along with its advantages and disadvantages, is relative. Einstein was also German, right? We fast forward to the 90s when the “Drivers Wanted” campaign produced a hugely popular TV spot known largely as “Da Da Da.” It was even appropriated by Microsoft. (If you’re interested, that wasn’t the only spoof done by Gates & Ballmer). 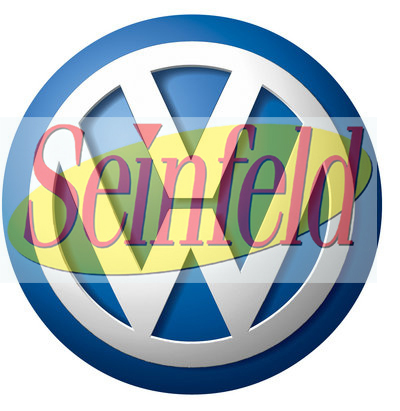 Near the end of the commercial the voice over tells us, “[the Volkswagen] fits your life, or your complete lack thereof.” How is the plot of Seinfeld usually described? “It’s a show about nothing.” Perfect. The commercial even plays like a mini-episode of the sitcom. That could be George and Jerry driving around Queens, finding a smelly… wait, wasn’t there an episode with a foul-smelling piece of furniture? You get the point. In “The Frogger,” from the 9th and final season, George hires a couple of questionable characters to move the old Frogger arcade out of its pizzeria home to preserve his high score. One of them is named Slippery Pete. Mr. Pete, better known as actor Peter Stormare (not sure if Slippery has any real life connection), later appeared in the above CP+B produced commercial as some sort of German un-pimping engineer. It wasn’t the agency’s, VW’s or Stormare’s best work, I just wanted to mention Slippery Pete. Some of these connections aren’t so subliminal. 5. Who’s the man in the cape? Perhaps Volkwagen’s most captivating piece of advertising, “The Force” made a major splash for the brand and agency Deutsch, Los Angeles when it released online prior to the Super Bowl in February 2011, followed by an airing during the big game. In less than five months it has racked up nearly 40 million YouTube views and spawned several parodies. Never to be outdone by a cute little caped Vader, Larry David donned a cape of his own in the season six episode “The Chinese Woman” to play Frank Costanza’s attorney. Can you blame him? It was good cape weather. Unconventional print ads remain part of the contemporary VW arsenal. Earlier this year Norwegians could take a test drive straight from an ad, using their smart phone. More recently was the introduction of The Edible Ad for VW South Africa. That sounds like something a little corporation called Kramerica Industries might come up with if it were an ad agency – or a company at all. From an oil tanker bladder to the Manssiere, Cosmo Kramer and his occasional intern, Darren, dreamed of taking Kramerica global. If only they could get it out of an apartment in Manhattan. This entry was posted in Brilliant!, Cars, Wait What? and tagged art, brilliant, cp+b, ddb, deutsch, print, seinfeld, tv, volkswagen, wait what?. Bookmark the permalink.